Recently, the award-winning production company Method Design was hired by the AICP (Association of Independent Commercial Producers) to create a promotional reel which would demonstrate the technological and visual capabilities of the organizations sponsoring this year’s awards program. The video utilizes motion capture software and sophisticated rendering programs to create a montage of dancing humanoid figures. The stunningly realistic but ultimately abstract and incongrous textures and effects used in this video contrast with the human forms to create a fun, surreal experience that bends the average person’s visual understanding. In addition, by making references to popular culture, the video reaches the viewer on a uniquely personal level, maximizing its overall impact. While the graphics do occasionally strain the viewer, this video is ultimately a striking example of the quality of CG in the present, and an indicator of CG’s potential to grow even more sophisticated in the future. I came across this project called “Arabesque Wall,” by Benjamin Dillenburger and Micahel Hansmeyer in collaboration with Design Exchange. It is a grand 3D printed architectural sandstone wall standing 10 feet tall with intricate details of the Baroque period. Forming almost 200 million surfaces, the details of this architecture is created at a scale of millimeters. The complexity generated by overlapping curves based on geometric rule imply luxury. 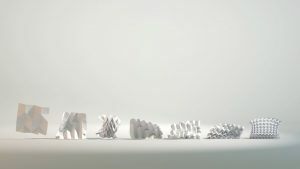 By utilizing “algorithms and computation to generate architectural form,” the designers spent four months of iterative computational design process of producing details impossible for one to achieve with bare hand. As modernist design articulate art of simplicity straying away from the richness of details and ornaments of the past, this project paves way for art/architecture to produce intricacy within a design that no history could afford. Integration of digital fabrication and computational design points towards the future of celebrating overwhelming and flourishing details. Although this project is closer to a sculpture than an architecture, it could lead to a generation of architecture fabricated entirely of digital fabrication machine such as a 3D printer. However, just as technology contributes both advantage and disadvantage, design itself may be dehumanized with less “touch” of hand in an art work. But because of the possibility of creating projects such as the “Arabesque Wall” with relative ease, it also opens an opportunity for artists to explore limitless complexity in design. This is Gisle Frøyland, a Norwegian woman proficient in computer science and visual arts. While I was browsing for “cool female contemporary artists”, I stumbled upon her work. Weirdly enough, I was actually in Norway over the summer and I saw an installation of hers in the KODEBERGEN museum of contemporary and Norwegian art. On the side of the installation was a table where there was an assortment of hats. Each hat had a specific design pasted on top of it and the viewer was to select a hat and put it on. Once the viewer had the hat on, they were instructed to stand in the middle of a black carpet above which there was a downward facing camera. The camera would detect the specific design on the hat and put on a personalized light show in front of the viewer. I actually fell in love with that installation and bonded with some strangers over it which was really enjoyable. Frøyland’s simple but interactive piece was engaging, curious, and quite entertaining. Other viewers and I were excitedly trading hats and laughing with each other despite the language barrier. Ideally, the only complaints I really had with the piece were that the hats were a little clumsy looking but I was blown away by the recognition and reaction of the camera and lights. It’s as if an “if/else” statement could be implemented in real life. I actually aspire to make art that involves viewer interaction as I think curiosity and play are key to exploring one’s creative nature. People like to think that they are separate from animals in that they’re sophisticated and knowledgable and communicate differently but when it comes down to flashing lights and shiny things, we all get roped in. There was something very primal about how this installation “trapped” us viewers through its dazzling and light-hearted appeal. 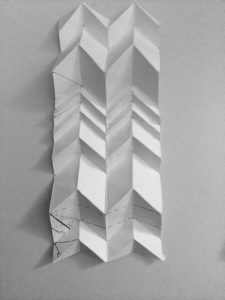 The project I came across in the Creative Applications Network is the Folding Patterns which stimulates the folded paper structure. This was created by Ann-Katrin Krenz and it operates to find ways to create 3D structures that behave like paper. This project tests out different scenarios of papers falling from a certain height to observe the collisions. Although it is still an ongoing project, it strives to develop the analyses of the behaviors of paper falling to create an algorithm. Finding a way to figure out and recored the behaviors of paper inspired me to learn more about this project. Personally, I thought it was interesting how Krenz is trying to develop an algorithm of the different behaviors and outcomes of paper falling to the ground because I had to work with folding papers on one of my projects during my second semester architecture studio. By using different ways to fold and make connections with paper itself, I had to try out many different shapes and test out how the marble on the paper would move through all the folded areas. I thought having this algorithm of the behaviors of folded paper might have helped me with my project a little if it were available. 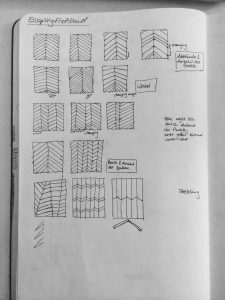 Because this project is looking at all possible ways that the paper might hit the ground, it is going to have many ranges of the way the paper falls with different folded structures. However, it also brings me to think about how the folded paper will be all different even if the paper was meant to be folded in the same way as another. To make the project closer to being accurate, all the paper structures of the same fold should be tested together because it won’t all go down the same way. 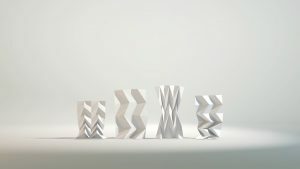 As an interaction designer and media artist, Krenz wanted to investigate more about the generative and visual behaviors of folded paper. Commissioned by the Bring To Light Festival NYC, this instillation (called “The Company”) is a sound reactive light installation by Nocte, in collaboration with designer Roland Ellis. 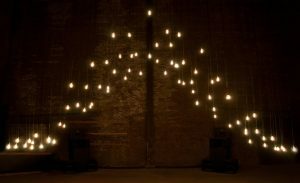 76 tungsten lamps are suspended to form an arch, and when music is played the lamps react to the sound. Each lamp is digitally controlled, which allows these animations to be created by the live audio. The piece is intended to bring the atmosphere of the architectural history of the building, which is it’s legacy as an industrial environment. My favorite thing about this instillation is the beautiful calming atmosphere it provides. I think that video is absolutely the most stunning documentation for this piece, as it provides the viewer much more insight into the way that the piece works, as well as the general ambiance of the instillation. I really admire that they were able to use advanced technology to create a piece that is simply beautiful, and appears to be magical. It’s not easy to guess how it works, and that mystery is part of the beauty of the piece. I think one thing they could improve on is the documentation, I wish they had more than one video of the piece, and documented how the atmosphere changed depending on what music was played. OMOTE is one of many projects lead by CGI artist and programer Nobumichi Asai using a technology he calls “face hacking”. 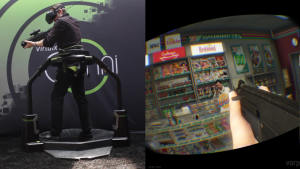 The team uses a code called Open CV which is used to map out physical objects and then project onto them while reacting to the subject in real time. Asai utilized this technology to not only map out the human face and project hyper realistic CGI elements, but he also developed an animation that would reflect the environment of the face, creating a realtime reflective texture. The project was showcased publicly on the internet with a 2 minute video two years ago and under the credits he lists himself as the technical director and only two other as CG designers. Asai himself has done other projection work involving sci fi movies such as Ghost in the Shell. The Sci fi imagery clearly inspires his cyborg like transformative projections. Additionally they also seem to influence his concepts behind his work of combining flesh with technology or at least giving the allusion of the two combining. 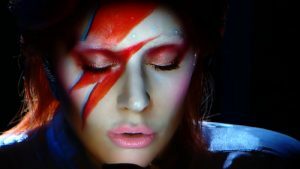 Recently he worked with Lady Gaga on her David Bowie tribute Grammy performance. The program allowed certain features of her face to be accentuated making her face look more like old glam rock star, while also allowing for animations of paint dripping and a spider crawling across her face to appear as if really happening on stage. This Technology has the incredible opportunities for other performing artist. It has the ability to potential push conceptual works as well as push narratives with in musical performances as Gaga did. 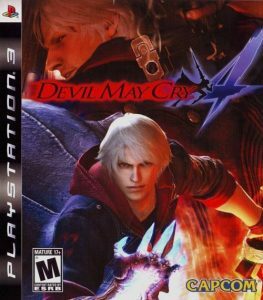 Devil May Cry 4. The fourth installment in a video game franchise – developed and published by Capcom in 2008 – famous for revolutionizing the action genre in gaming, priding itself in its extensive combat mechanics, and bringing us some of the greatest moments in gaming history. Devil May Cry 4 is one of those special gems that encourage me to possibly pursue a minor in Game Design, and what impresses me in particular is the engine on which the game runs, called MT Framework. Reverse-engineered from what was originally a PC engine, MT Framework has astounded me with just how much Devil May Cry 4 had going for it. Specifically its frame-rate of 60fps, complete in-game graphics, and solid performance, to name a few. For a game released 8 years ago, this was incredible production quality, and still is even by today’s standards. I commend the developers for prioritizing those aspects of the game, which are so important to get right in gaming that even current developers still struggle with or just flat-out neglect. If anything, I see this as a shining example of polishing a computational project for maximum performance, as well as a standard to uphold, negating modern triple-A game developers excuses of sub-par performance in some of their games, despite multi million-dollar budgets and large development teams. As a Decision Science student you learn that there are three main types of decision making theories- Normative (what decisions we should make), Descriptive (what decisions we do make), and Prescriptive (how we can make better decisions). Personally I tend to be more interested in studying prescriptive theories because the by the nature there is more room for creativity. Nudging is one common type of prescriptive theory that allows people to make better decisions by making the optimal decision more effortless. In a freshman year course, a professor showed a video showing a Volkswagon campaign using a nudge. In order to get more people to take the stairs rather than the escalator they turned the stairs into working a piano. The stairs worked as keys, playing notes as people walked up and down. By making the stairs interactive and fun, Volkswagon was able to get people to make a better, more beneficial decision. I found this installation fascinating. While it took real time and effort to write the script and build the hardware to turn the stairs into a working piano, and Volkswagen made absolutely no profit from this, it was a great experiment to show how interactive design can influence behavior, and in the case, influence decision making. I admire how effective this project was. Moving forward in my academic career, I would like to explore how design and digital interaction can influence and improve consumer decision making. This project has shown me that can be effective. 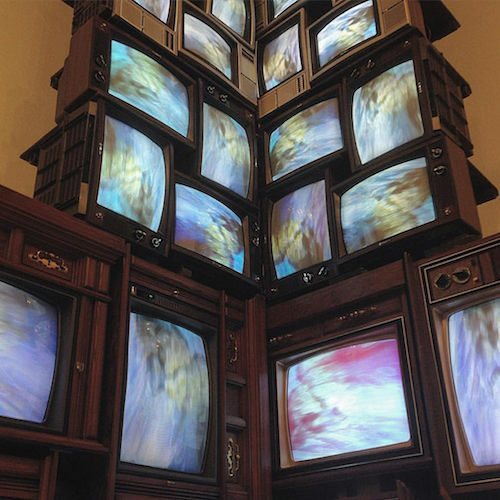 V-Pyramid (1982) by Naim June Paik is a sculpture composed of 40 individual television screens, stacked on top of each other into a giant pyramid. Paik used his own video synthesis technology to create the images and video the screens display. Sound plays a big role in the piece as well: the pyramid blends together rock music, traditional Korean music, and raw noise into one sonic experience. This project shows both the potential of new technology itself (in 1982 this video tech was cutting edge), but also the potential for combination between physical or structural art and digital or computational art. Without the “ziggurat”-like structure, the piece would lack permanence and gravitas, and without the hyper-modern audio and visuals, it would lack immediacy and interest.